Fordogtrainers welcomes to check the line of hand-painted dog collars. You will definitely find the one that will fit and suit your doggie. There are dog collars with flags painted on them, with fire flames and with barbed wire. You can't miss the chance to buy hand-made exclusive item to emphasize your dog's unique style. Moreover, the painted collars match our collection of hand-painted dog muzzles. Choose the perfect outfit for your dog's training and walking. New Collection of Glamour Leather Dog Collars Is Ready To Be Presented! You can prefer classics in everything, even in dog equipment, but you won't help loving our latest collection of Trendy Colorful Dog Collars. It is designed of pure leather and painted in safe paint. We used special secret technique of applying a paint. Handling your pet with one of these presented collars will be full of comfort, safety and style. ForDogTrainers Presents Unique Handcraft - Painted Leather Dog Harnesses for "Pro Training"
Get the best absolutely unique hand-made painted attack / agitation dog harnesses! All customers have the option of three absolutely awesome paintings - 'American Pride' - for true patriots; 'Hot Flames' for active dogs; 'Barbed Wire' for strong unflinching pets! Everyone is welcome to find out more about expanded line of dog grooming tools. Learn more information on dog grooming and must-have kit for this purpose. ForDogTrainers is ready to offer items that will help you maintain your dog's grooming in the healthiest and safest way. Already today, you have an excellent opportunity to revolutionize your dog's feeding system! ForDogTrainers presented two types of Feeders of different dimensions. You just need to order Intermediate Dog Feeder Designed for Safe and Fun Food Consumption according to your dog's breed! Just think of it! No more Gulping, Bloating and Overeating! Your dog will eat much slower and as you know this is a healthy way of eating! 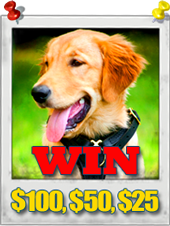 Another great opportunity to participate and win Amazing prizes is granted by ForDogTrainers company. Winter Dog Photo and Video contests of International Scale have started. Everyone is welcome to show his/her precious doggy to the Entire World. The most creative and extraordinary photos are likely to win but that is for people to decide. A lot of efforts were exerted to make both these contests as transparent as possible. Only 'fair play' is possible. ForDogTrainers company pushes forward by introducing rebranded line of dog training balls. Every dog owner and dog trainer will find the ball that will meet his needs for training session or simple daily walk. 2 the most expected events of this Summer have started. Everyone is welcome to participate in dog photo and dog video contests. The most interesting, extraordinary, touching videos and photos will get tremendous prizes. Monitoring today market demands Fordogtrainers.com couldn't but notice extreme demand on multitasking nylon dog harnesses that has been recently designed. The company's CEO was asked to explain why this very product became so popular in such a short period of time. He said that there are solid reasons. Super effective ultrasonic devices were designed in Germany to solve dog's disobedience and pulling on a leash problems. Now they are available on Fordogtrainers.com. Great effect, no harm for a pet. Products are snatched away in a blink of an eye. Worldwide Photo Contest For All Dogs And Their Owners! 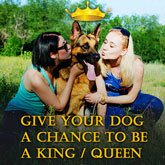 Great opportunity to show lovely pets to the world and get amazing prizes. Rules are simple. Take high quality photo of your pet and submit! Involve everyone in voting for your pet. 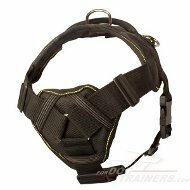 ForDogTrainers company expands its range of products launching professionally designed dog training harnesses for military service, customs, and police. Designs are approved by experts in dog training. International standards of quality and safety are met. Creative designs of safe dog walking and dog training muzzles won't leave anyone indifferent. Products are suitable for daily wearing as well as for special occasions. Paint is water-resistant and non-toxic. It is impossible to find something better for safe pet walking on holidays. Combine safety with style!